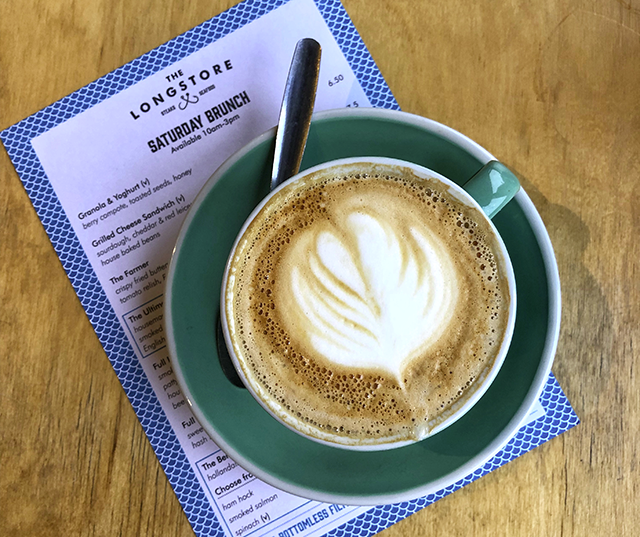 New to The Longstore in Charlestown is Saturday brunch, which is quickly becoming an institution for locals. With views over the harbour, the restaurant is a great place to while away a few hours with a stack of newspapers and “bottomless coffee”. 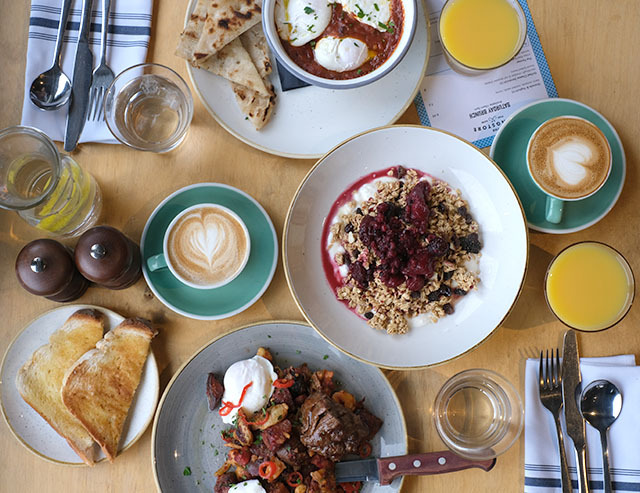 The menu is really good (see here), with a range of classic dishes such as “Full Longstore” (a traditional full English but with a Longstore twist), and Eggs Benedict. Other mouthwatering dishes include “The Farmer” (crispy fried buttermilk chicken, fried egg and tomato relish in a muffin), “The Ultimate Breakfast Muffin” (a muffin filled with sausage patty, hash browns, smoked back bacon, fried egg and Cheddar cheese), and a grilled cheese sandwich (sourdough with Cheddar and Red Leicester cheeses and house baked beans). We tried out the new brunch offering in early January. 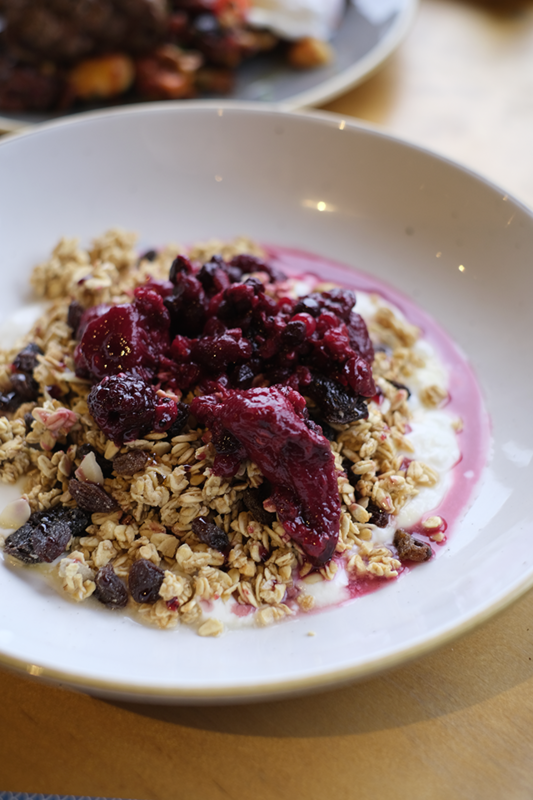 From the standard menu, we opted for a bowl of granola, beautifully crunchy, packed with fruit and seeds, topped with berry compote, and served on lots of lovely natural yogurt. This was a huge portion for £6.50, plenty for two to share if you are having other dishes too. Each week there is a selection of dishes on the specials board. 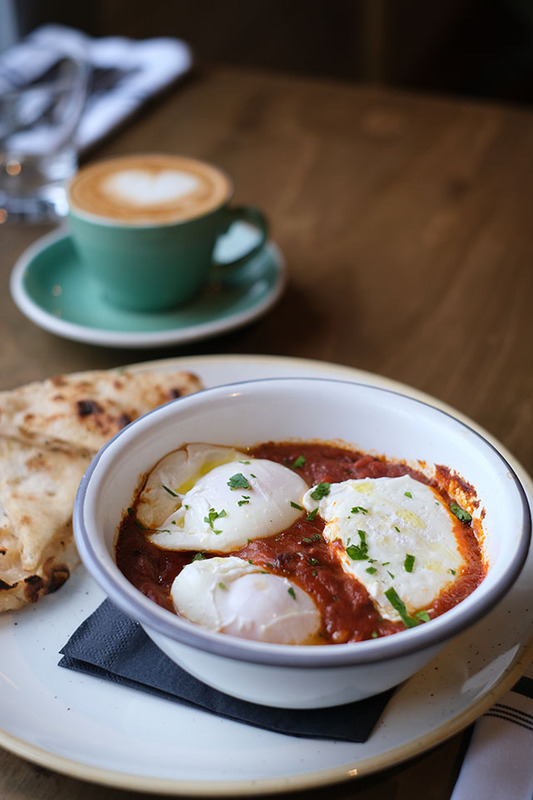 I couldn’t resist the shakshuka, a warming bowl of chorizo, beans, fennel and tomato, with baked eggs and chargrilled flat bread. This was so flavoursome and moreish, and I could eat it again and again. 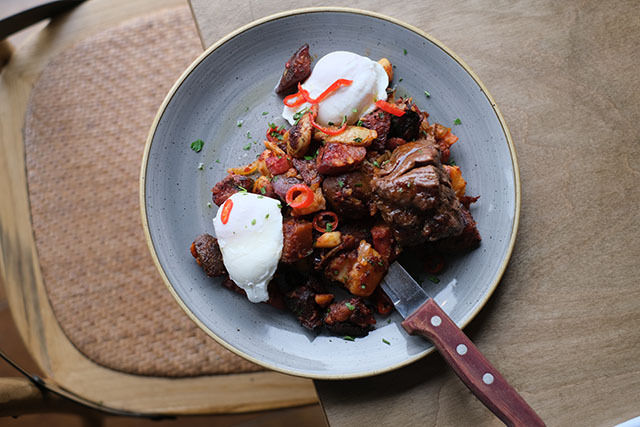 Jim opted for the ‘nduja potato hash, basically a heap of refried potatoes mixed with ‘nduja (a spicy spreadable salami) and plenty of fresh herbs and chilli. This was served with a perfectly pink 4oz fillet steak, and two poached eggs. Definitely not for the faint-hearted, this was a big dish with big flavours. 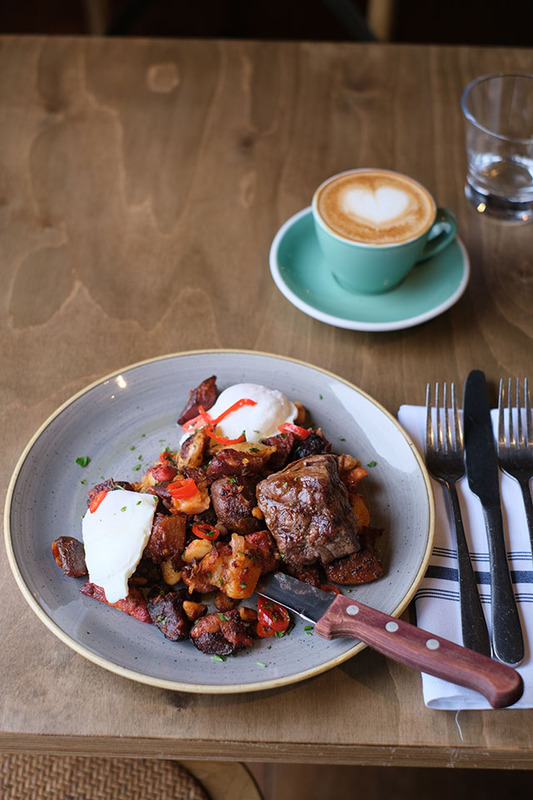 Other dishes on the specials board included a kids’ breakfast, steak and chips, and a toasted sourdough sandwich, filled with avocado, tomato salsa and poached eggs. 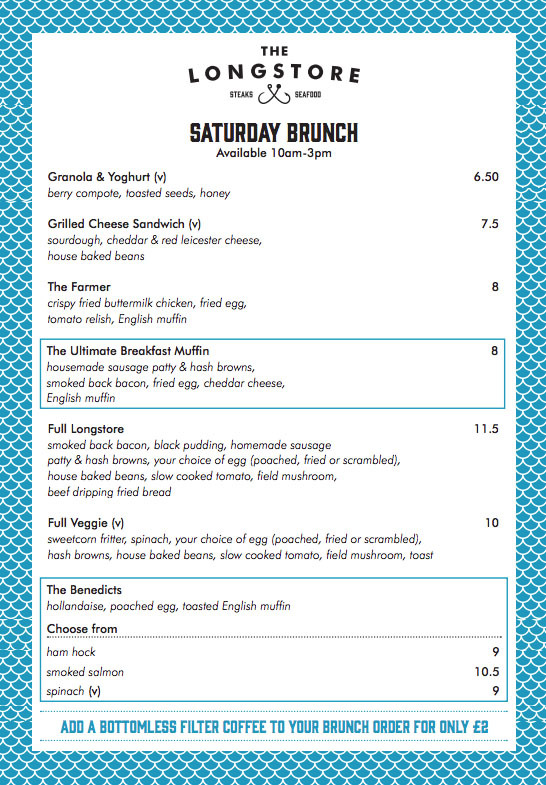 Brunch is served each Saturday from 10am to 3pm. For more information, to see the full menu, or to book a table, visit www.thelongstore.co.uk. N.B. We paid for our food, which cost £32.85 for two people, and our drinks were complimentary. Thank you to the staff at The Longstore for looking after us very well.